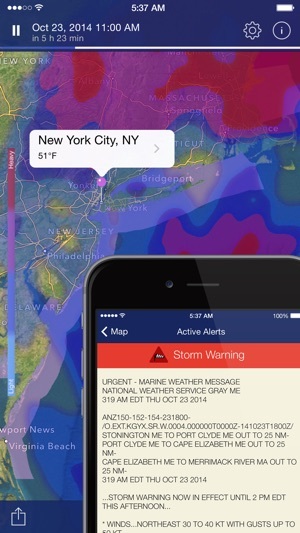 * All National Weather Service watches, warnings, and other alerts are shown on the map as interactive polygons covering the territories they're active for. Tap one to get the full alert text. – NOAA Radar Pro is now available in Thai, Vietnamese, Indonesian, Norwegian, Swedish and Danish. I have always liked tracking weather whether it be seeing incoming rain when I'm walking my dog or keeping track of a hurricane as it heads toward land (or not) or up the coast. 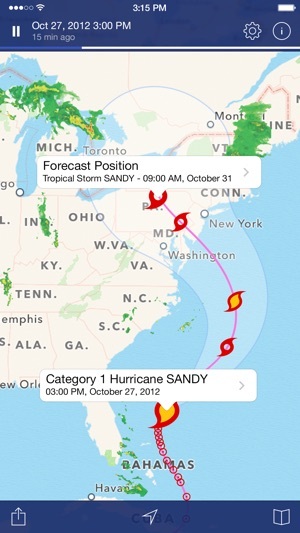 I like that I can see predictions of a hurricane's progress. What I don't like is that as I tap on a forecast point I have to go through two levels. 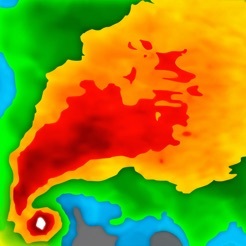 First the white rectangle that tells me little more than the storm's name and its intensity. Then I can get a full-page report of its name, intensity, projected wind speeds, and mapping coordinates. Then if I want to get a sense of how it's moving, I have to go back to the map and repeat the whole process. Tedious and not very efficient. How about the white rectangle actually giving useful tracking info rather than long spelled out labels? Category 3 = Cat3. The date and time of the forecast so I can very efficiently track along the path and get a sense of how fast it's moving and how it's gaining or losing strength. I like being able to bookmark locations so I can quickly check places where my kids live or to which I frequently travel. Last thing, even though I deleted the bookmark, the map defaults to a place (Gould, RI) that doesn't exist. How about I be able to designate one of my bookmarks (like my home) as the map default. It's coming close but it's missing the mark. I have to say that after using this app compared to the multitude of other weather notification apps that I have, I am not impressed at all. I live in Savannah, GA where we get some pretty bad weather from time to time and I like to know when that weather is on my back door. Just recently we had a mild tornado outbreak, as well as a slew of severe thunderstorms. 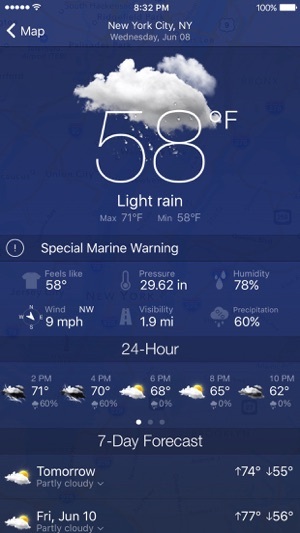 Of all of the apps that I have for weather with the notifications turned on, NOAA was the very last app to give me a notification that the storm was happening, and at times that notification was almost an hour after the storm had passed. 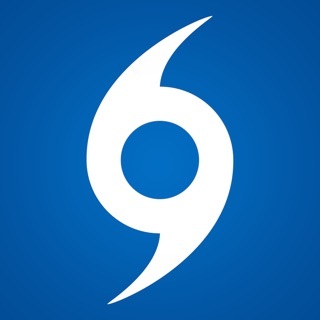 If this was the only app that I had giving me notifications, my family and myself could have wound up seriously injured or worse if just one of those tornado producing storms had hit my house and I was relying on this app. 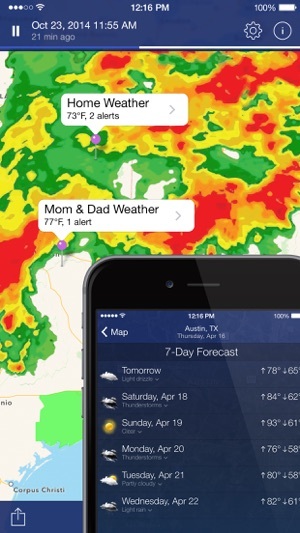 The sad thing is that this is a paid app, that I purchased for a little bit of reassurance during bad weather to give me some piece of mind and the only thing it has done is make me more weary about severe weather in my area. And for anyone that reads this and is wondering, this has not been the only time that the app has been extremely delayed in letting me know that there was bad weather approaching. 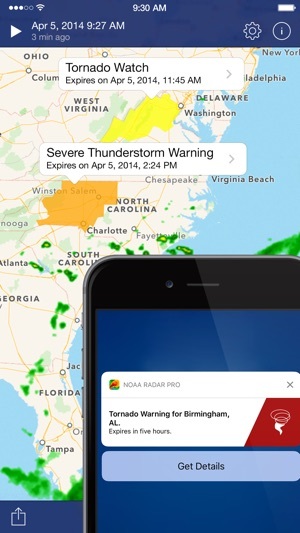 It happened in April, as well as January, during the tornado outbreak across GA. So basically, it's not a fluke. We are grateful to you for sharing your experience with the app! We are sorry you faced issues with the app’s notifications as they are meant to and usually are delivered without delay. We will take a look at the data issued for the mentioned location and will keep working to provide timely and accurate data and alerts in the app. We hope you stay tuned for the app’s news and updates in order to receive and benefit from the latest improvements. Thank you for sharing your feedback in the comments! People were complaining about large location icons, fast radar time lapse, etc. Well guess what? There's options to change those in Settings! Just because you're not App Savvy doesn't mean you should give bad ratings and complain. I'm a 47 year-old single mother and if I can figure out what the circular gear icon symbol means and tap it to find the settings you can too! You can also choose map or satellite imagery, the degree of clarity on the coverage of the "clouds" so you can still see what city it is. Change the speed of the playback. How long do you want that red pin with the nice, visible print for the location to stay there? 10 seconds or 1 minute? I think there were 4 options. Those are just the ones I looked at before the "please rate the app" popped up. Hi Momlovesames! Thank you for the feedback! if you have any options in mind that you would like to see in future versions - please let us know!